This is an exciting internship with ILGA, the world association of more than 1300 LGBTI (Lesbian, Gay, Bisexual, Trans and Intersex) members’ organizations. 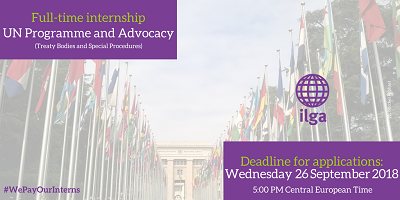 The intern will provide assistance to ILGA’s Senior Officer, Women and United Nations Advocacy, with a focus on Treaty Bodies and Special Procedures. It is an excellent opportunity for somebody who has an interest in human rights and LGBTI issues and wants to gain experience in working on them within the framework of the United Nations human rights mechanisms. The internship is for a period of six months, commencing on 29 October 2018 and ending on 29 April 2019. The internship is virtual, and the intern can be based anywhere with good internet connection. The exact working hours and dates can be flexible, but a candidate should be available to work full-time (37.5 hours/week). Candidates meeting the requirements are invited to complete the application form. Closing date for receipt of applications by email to kseniya@ilga.org: 26 September 2018, 5pm Central European Time. We expect to communicate our decision to shortlist a candidate on 4 October 2018. Only the selected applicants will be advised of the outcome of their application at that time. Shortlisted candidates will be asked to complete a written task and to deliver it by 10 October 2018. Results of the assessment of the written task will be delivered to the candidates by 17 October 2018, and the interviews will take place on 18-19 October 2018. We expect to make the final decision by 24 October 2018. Please bear in mind that if you have not been contacted by 4 October 2018 you are not selected for the position. Unfortunately, we are unable to respond to queries about this internship. It aims to ensure that all full-time and part-time employees, potential employees and other individuals receive equal treatment. ILGA promotes gender and equality mainstreaming. Hence it actively promotes equality in all policies and actions. All applications will be treated with the strictest confidence. If more than one applicant is considered to be equally qualified for the position, priority will be given to applicants coming from marginalised and/or underrepresented groups.